"I discovered my love of politics when I realized that I love learning about how human beings can and should live together in political communities." “Welcome to the 116th Congress: Here’s your reading list.” Washington Examiner. February 2019. “Supreme Court Balances Fourth Amendment Rights and a Government Duty.” Washington Examiner. June 2018. “What Should Courts Do About the Mistakes They Make?” Washington Examiner. June 2018. “The Supreme Court was Right in Minnesota Voters Alliance v. Mansky but it Misunderstood the Issue” Washington Examiner. June 2018. “Neil Gorsuch Made the Right Call in Sveen v. Melin”Washington Examiner. June 2018. “Courts, Cars, and Conscience: Why We Must Defend Freedom of Speech”Washington Examiner. May 2018. “Supreme Court Needs to Clarify Gun Rights under the Second Amendment.” FOX News Network. March 2018. “3 Reforms for Repairing Congress, the ‘Broken Branch. '” The Hill. January 2018. Justice Stephen Field’s Cooperative Constitution of Liberty: Liberty in Full. Lanham, MD: Lexington, 2017. “Running the Robed Gauntlet: Southern State Courts’ Interpretation of the Emancipation Proclamation.” American Journal of Legal History (Forthcoming). “Equality, Prejudice, and the Rule of Law: Alabama Supreme Court Justice Thomas Peters’ Protection of African-Americans’ Rights During Reconstruction.” Journal of Southern Legal History (Forthcoming Fall 2017). “To Inform and Recommend: Hamilton and the Constitutional Ground for Interaction Between Executive Officers and Congress.” Presidential Studies Quarterly (Forthcoming Fall 2017). “Constructed For Liberty: Justice Clarence Thomas’s Understanding of Separation of Powers.” American Political Thought 5, no. 4 (2016): 658-85. “Free and Happy Bonds: Loving v. Virginia’s Nineteenth Century Precedent on Marriage and the Pursuit of Happiness.” Perspectives on Political Science 45, no. 2 (2016): 87-96. I discovered my love of politics when I realized that I love learning about how human beings can and should live together in political communities. From this interest, I found enjoyment in reading and considering the great works of Western civilization that discuss the meaning of justice, law, institutions, and the ordering of human life by these ideas. The purpose of higher education is to cultivate human beings and citizens, which it does by cultivating in students the desire and capacity to contemplate both their humanity and their citizenship. My teaching method focuses on conversations about important texts of political thought, predominately within the history of political philosophy, Constitutional law, and American political thought. This focus allows students to encounter great thinkers and ideas directly and to interact with them and with one another. We seek to understand the authors as they understood themselves and then engage them in a respectful but analytical fashion. 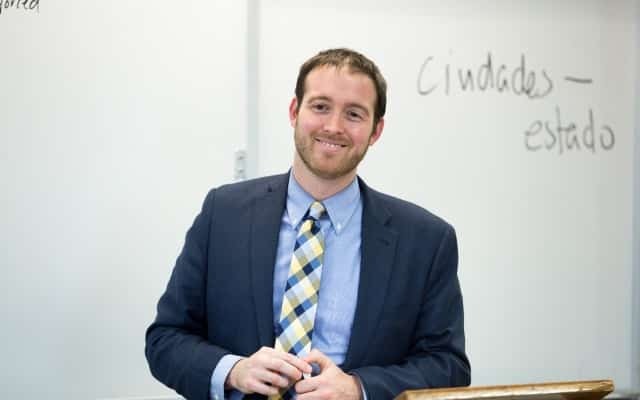 I love to teach, but I especially love teaching at Hillsdale, which I have done since 2014. The students here are thoughtful, hard-working, and possess a generosity of spirit that makes them a joy to interact with. Hillsdale’s politics degree offers the chance to converse with Aristotle, Locke, the American founders, Lincoln, and many more of the great political thinkers and statesmen of the past. A focus on these areas is rare in today’s higher education, yet it is vital, and it is what we strive for here. In my free time, I engage in scholarly research and writing, spend time with my wife, Emily, as well as friends and family, and watch copious amounts of sports—namely Baylor and Ohio State University college basketball and football, as well as my beloved Cincinnati Reds.